This is the sort of Bible story book you want to have several of, so you can always keep one nearby and still be able to give them to all your friends. I’ve been eager to see the first children’s book from one of my favorite Christian authors, Kevin DeYoung, and my copies arrived a few days ago. You never know what will emerge when a writer attempts something different from his usual fare. In this case, I’m happy to report the result is excellent. 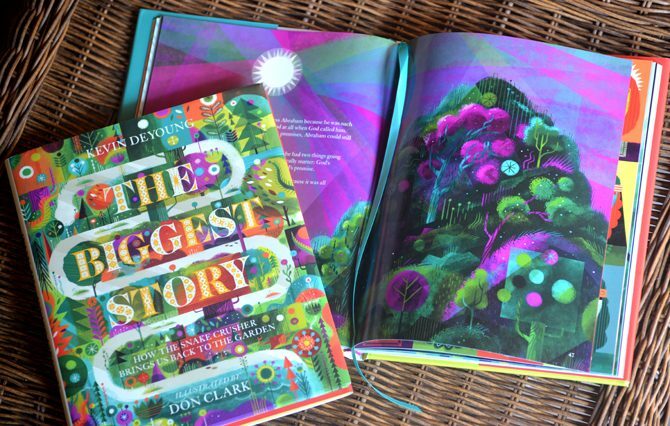 The Biggest Story: How the Snake-Crusher Brings Us Back to the Garden is a delightful book that tells the Bible’s grand story in 128 colorful pages. It belongs next to well-stuffed chairs and on bedside tables everywhere. I suspect people will rave about the illustrations, which deserve all the praise they’ll get. But the deeper beauty of The Biggest Story lies in the way it identifies key themes in the story of salvation and draws them out, showing us how they lead to Jesus. This is a book with a teacher’s soul. When I teach through the Old Testament, I don’t just tell a series of exciting stories. Rather, I’m concerned about the Bible’s core message. I try to get the kids I teach to latch onto important ideas that are repeated throughout Scripture and will help them understand Jesus: how sin separates us from God, how God comes down to save his people, the centrality of faith, the need for a better prophet and priest and king. Guess what? The Biggest Story focuses on all those themes, plus several more that don’t often find their way into children’s books but should. For example, I like how it includes the account of Cain and Abel, which frequently is left out of lessons for kids even though it sets up important biblical truths. And I actually uttered an audible “yes!” when I turned the page while reading about King David and saw that the book includes God’s promise to make David’s son the ruler of an everlasting kingdom. That’s a key moment in the Bible’s storyline that rarely gets mentioned in children’s books, probably because the story has little action. 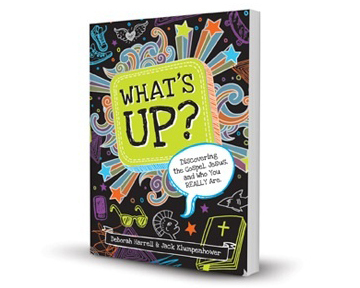 The fact that it appears in this book shows how DeYoung is not merely trying to entertain kids with interesting stories; he wants to teach them the big picture and give them some theological depth. There will be comparisons to The Jesus Storybook Bible by Sally Lloyd-Jones, which also offers captivating illustrations and a focus on Christ. The two books are actually quite different. The Jesus Storybook Bible is a collection of stories which each point to Jesus, sometimes in clever ways and always with charm. The Biggest Story is a single story that tells of salvation. It doesn’t constantly jump ahead to Jesus, but in its own way it too is relentlessly Christ-focused just by accurately summarizing the Bible’s grand story. DeYoung’s writing is plain-spoken as always, but his cadence works well enough for young ears. As a teacher, I often find myself summarizing large chunks of the Bible story in order to give context for the lesson I’m teaching. Many of DeYoung’s summaries of biblical events are simple and excellent. For example, he sums up the Israelites’ struggles during the time of the judges like this: “They constantly had enemies to fight. And worse, they constantly had to fight the temptation to be just like their enemies.” That’s a memorable way to cover many chapters of Scripture in two sentences while remaining true to the Bible’s own emphasis. In a few places, I might have liked a broader view. The book repeatedly depicts Old Testament times as a period mostly of failure. True, there was much unbelief, and the age of the Spirit had not yet arrived. But a few examples of men and women practicing faith in those days would be a nice addition. Also, the years between Jesus’s birth and his crucifixion are covered too quickly to give much sense of what kind of guy Jesus is. The key theological points are hit (hooray for that! ), but not the personal ones. Yes, it’s great to see Jesus as the Prophet, Priest, King, Chosen One, Deliverer, Judge, and Snake Crusher. But it’s even better to also see the amazing man who touched lepers, ate with tax collectors, spent entire nights in prayer, and replied to his betrayer’s kiss by calling him “friend”—a real, fleshed-out person. Without this, we run the risk of viewing Jesus only as the culmination of a bunch of themes, missing the man of mercy who is so stunning that we gladly lose our lives to gain him. 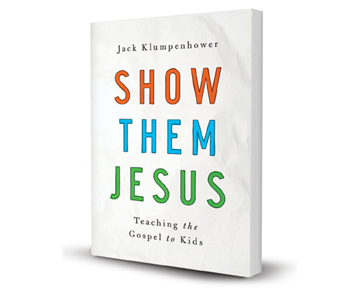 But no book can do everything, and The Biggest Story covers the territory it stakes out with sharp biblical insight kids badly need—plus a whole bunch of rich pictures. 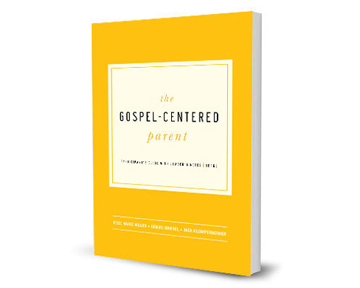 What a great help to Christian parents and teachers! Sounds great! Does it have detailed illustrations of Jesus in it? There’s a nondescript baby in a manger (round bundle with dots where eyes would be), a hand reaching out to Mary at the tomb, and a silhouette figure with a crown of thorns seated in heaven. None of these is “detailed.” I would describe them as abstract figures. No one would look at them and think, “That’s what Jesus looks like.” Yet, the figures clearly are meant to represent Jesus. The prevalence of pictures of Jesus in children’s materials is a great topic and one I’ve thought about writing on (but haven’t yet dared). I couldn’t agree more with your review. I bought a case of these and really can’t wait to give it out to families. The section on Jesus, though, definitely had me desiring more. But, all in all, I love the way its laid out and I love the story it tells. It’s a great family resource.